What Would Tony Soprano Think of Donald Trump? Tony Soprano is back, in the media if not in prime time. In the year of the superhero, the anti-hero is old news. But the ghost of the mob boss of "The Sopranos," the end-of-the-'90s blockbuster, is celebrating the 20th anniversary of the premiere. "The Sopranos" was a true cultural and political icon, and Tony has been summoned from the grave to talk about what he thinks about Donald Trump as the president. Tony was only a make-believe character, and he died (we think) in the series, but he would have had an opinion about President Trump since everybody else does. So why not hear it? Tony's son, A.J., wanted to be a helicopter pilot for Donald Trump -- the tycoon, not the president -- in the final episode. Recalling this, The New York Times asked the show creator, David Chase, who is promoting a prequel movie, how that might have worked out. "He might be the new chief of staff," Chase said wryly. But he doesn't think Tony would think much of the president. "He would think the guy was full of (expletive)," he said. He would see Trump "as a "penny-ante" crook. This may be the first time Donald Trump has been put down as "penny-ante," perhaps the unkindest cut of all. In an era where art and reality are continually blurred, this may finally be a fresh criticism of Trump, an attack from the undead and the unwritten. But why not? "Fake news," fake criticism. It's a relief from the endless repetition of the game of "I'll listen to what you think of Donald Trump if you let me tell you again what I think." But even a two-decade-old drama strains for the insight of hindsight. James Wolcott, writing in Vanity Fair magazine, sees the gangsters in the show as whining, toxic white males who could use a Gillette shave, playing the blame game in reaction to their declining whacker clout. That naturally makes them embryonic Trump fans. He says the show "pulls back the tarp of the underlying malaise afflicting white America, a malaise compounded of postwar nostalgia, creeping age, waning virility and vital purpose, and a nagging belatedness." When organized crime became secondary to terrorism as something to fear after 9/11, these television wiseguys became prototypes for Trump supporters, angry about being demoted in status. "It's the Make America Great Again mentality in its dormancy, Trumpiness on training wheels," he writes. This would be satire if it weren't so earnest. 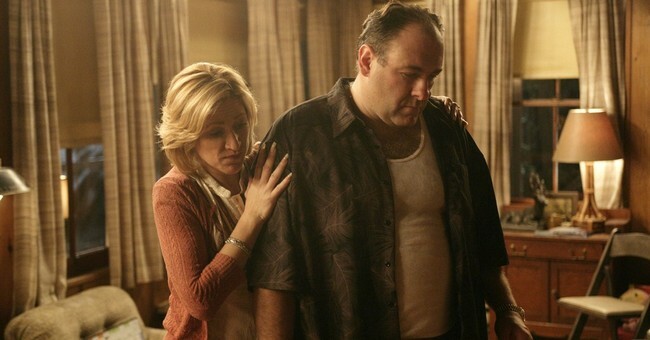 Tony Soprano is recalled to fit the politically correct "gripes of wrath." Murdering and maiming aren't the worst of his offenses, says Wolcott. His "slow-motion assault on the environment" is the worst. Since Tony's wealth comes from a waste management business, his diversified toxic dumping of dead bodies also includes asbestos. Toxic white male, toxic dumper. The anniversary of "The Sopranos," despite silly revisionism, reminds us how this show changed the quality of drama on the small screen. Television drama is no longer the stepchild of the movies but capable of brilliant storytelling with characters and plots that Hollywood actors line up to get in. Who can forget that iconic first scene of "The Sopranos" in a New Jersey suburb, when we were introduced to a portly man with delight on his face, shuffling around his garden, feeding the ducks splashing in his pool. Morning becomes a mafia don. Affability in feeding the ducks hides the monstrous nature of this complex crime chief with two major devotions, his gangster family and his nuclear family of a loving wife, son, and daughter. He wants to make sure they enjoy the American dream and thinks only his violent, nightmarish life can make that possible. In one humanizing moment, Tony learns it might be easier to be a godfather disciplining his gangster thugs than to discipline his teenage children. He warns his wife not to overplay their authority, lest the teenagers discern their parents' powerlessness. In another moment, Tony takes his daughter to visit a college campus and detours to murder a rival mobster he recognizes who had been put in the Witness Protection Program. There's no Dr. Jekyll, only Mr. Hyde. He's more at home as the patriarch in the crime family with its old-country rules than with his nuclear family straining at middle-class values. Such is the stuff that television ratings are made of. But that doesn't explain the lingering appreciation of the show, recalling how on Sunday nights two decades ago, families and friends gathered around a television screen, taking no phone calls so as not to interrupt the television show that set the gold standard for presenting an anti-hero, a larger-than-life monster in the flesh who walks on clay feet. Tony lives in his own mortal fear lest those clay feet crumble beneath him.